Minister of State, Joseph Harmon addressing the Annual General Meeting of the Guyana Manufacturing and Services Association. Seated are (left to right) Minister of Business, Dominic Gaskin; Association President, Shyam Nokta; President of the Private Sector Commission, Eddie Boyer and Executive Member of the Private Sector Commission, Ramesh Dookhoo. The Guyana government on Wednesday announced plans to stamp out the dumping of cheap, dangerous and substandard products on the local market, while at the same time urging the business community not to engage in double-standards when steps are taken. “I recall last year when certain arms within the government started to take steps to clamp down on dumping, many of us here in the private sector cried foul, when people were bringing items that were mislabelled and passing it off on the Guyanese consumers. We were castigated about that,” Minister of State, Joseph Harmon said. He made the announcement in an address to the Annual General Meeting of the Guyana Manufacturing and Services Association (GMSA), moments after executive member of the Private Sector Commission, Ramesh Dookhoo raised concerns about the failure of successive governments to enact anti-dumping legislation. Harmon said government was working with the Competition Commission to enforce the Consumer Protection Act to target offences such as price-fixing, conspiracy, dumping of inferior and harmful products and misleading advertisements to “protect consumers from errant private sector operatives”, minimise unfair competition, reduce processing time and improve service delivery to the private sector. Saying that the private sector had written six different ministers over several periods of government urging them to enact the required legislation, Dookhoo called on government to follow in the footsteps of Jamaica and enact anti-dumping legislation. 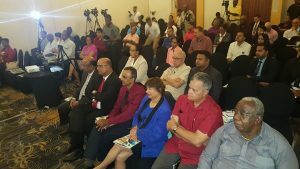 Participants at the formal opening of the Annual General Meeting of the Guyana Manufacturing and Services Association that was held at the Pegasus Hotel on March 28, 2018. “We need to introduce anti-dumping legislation in Guyana. We have been preaching this for ten years. We need to do this. We have moved from a state where we never had anything in 1985 and now we moved to a stage where we import everything. It’s don’t matter what the standard is. We import everything into Guyana so our manufacturers are heavily stymied by that,”said Dookhoo who is in the executive management of Banks DIH Limited. As an example of dumping, he noted that an imported beer is selling at six bottles for GY$1,000, below cost. He noted that the anti-dumping provisions in the Caribbean Community’s (CARICOM) Single Market and Economy regime was a failure. “We wrongly tell ourselves that there are provisions in the CSME for dumping. 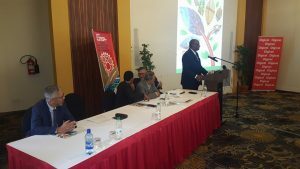 It is not; it don’t work; there are provisions but they don’t work,” said Dookhoo who is also on the executive of the Caribbean Association of Industry and Commerce (CAIC), the regional umbrella private sector organisation. He said it was too expensive for manufacturers to acquire all the required information from the extra-regional companies to make out a case against dumping. Chairman of the Private Sector Commission, Eddie Boyer also added his voice to calls for “a concerted effort” to address the issues of smuggling and dumping. “We must look at smuggling and dumping in the context of what I see in certain areas- in terms of values for products that are coming in. Maybe cement is one,” he said. The GMSA’s Annual General Meeting was also addressed by its outgoing Chairman, Shyam Nokta . He and Boyer both raised concerns about delays and inefficiencies in government services, unfair competition due to evasion of Value Added Tax and other taxes, unstable and expensive electricity supply, and the absence of good docking and other required transportation facilities. The PSC and the GMSA pledged to work with government to address concerns.